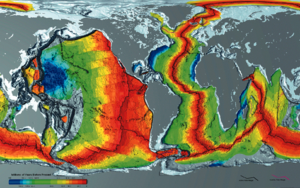 Age of oceanic crust; youngest (red) is along spreading centers. ↑ Hess, H. H. (November 1962). 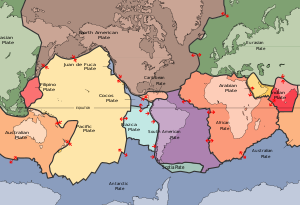 "History of Ocean Basins" (PDF). में A. E. J. Engel; Harold L. James; B. F. Leonard. Petrologic studies: a volume to honor A. F. Buddington. Boulder, CO: Geological Society of America. पप. 599–620. पहुँचतिथी 8 September 2010. ↑ Elsasser, Walter M. (1971). "Sea-Floor Spreading as Thermal Convection". Journal of Geophysical Research. 76: 1101. Bibcode:1971JGR....76.1101E. doi:10.1029/JB076i005p01101.